Thanks to Pepi you can now get this premium quality street food in Vienna. Before only located in Linz, their branch ℱᓮﬡᗩᒪᒪᎩ made it to the capital in 2015. Since then they opened two more shops, at the airport and the main train station. At all of them, you can eat your Leberkäs on a plate or on the go. I used to love this warm snack – have gone vegan in between – but still, want to share the Austrian specialty with you. Every carnivore should have a bite of it, coming to the land of Schnitzel! It is hard to describe what it is and what’s in it. However, it is not cheese and not liver. You can get a warm “Leberkässemmel” at almost every supermarket in the country, yet their versions can’t keep up with high-quality Leberkäs like Pepi’s. 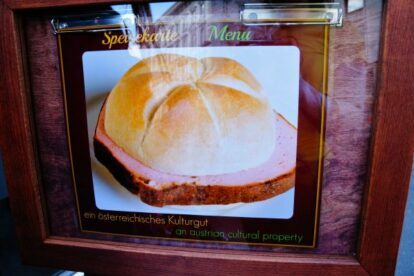 Check out his version of this “meatloaf” in a Semmel when in Vienna (or Linz;)! For frequent visitors, there’s the member card with discounts. The price depends on the size of your Leberkäs piece. Usually, they cut slices quite bounteously – if you prefer a thin one, better inform the staff when ordering. My favorite had been the spicy chili one in a Mohnweckerl but if you go for the first time maybe start with their classic. Muslim buyers like the turkey hen and the adventurous decide on the horse. Their meat friendly customers range from little boys to grannies, and there’s a favorite for everyone. Come and pick yours!